Great way to organize all your CDs in a standard 3-ring binder! Store your software programs, games, and music CDs with their jewel cases more efficiently. 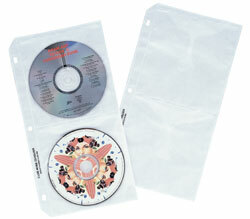 Clear, heavyweight vinyl allows you to see your CDs more clearly while providing them with the utmost protection. Holders store two CDs per page. Allows easy access to jewel cases since the binder rings do not get in the way when inserting or removing them. Sturdy heavyweight flaps secure CD in place. 10/PK.